calls out to the person who presented it and seizes the rod of offence." 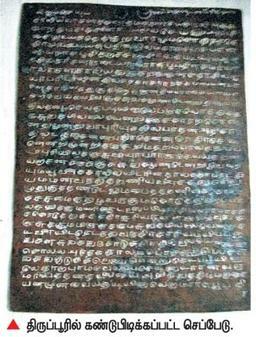 Means : " The letters are said to be from 'a' to 'n' (அகரம் முதல் னகர இறுவாய்), thirty in number, excluding three whose use are dependent on the others"
The Tholkappiam itself has an explicit reference to writing in Book - 2, Chapter -1, Verse -60, where it refers to the inscription on commemorative stones of the name and valour of warriors who distinguished themselves in battle. the complete stages of erecting memorial stones to the dead heroes , also gives the rules for erecting such memorials to the hero and about inscription on the stone. The stages mentioned are generally, “kaatchi, kaal kol , Neerppatai, Natuthal, Perumpatai, Vazhthal [காட்சி, கால்கோல், நீர்ப்படை, நடுதல், பெரும்படை, வாழ்த்தல்]”. The first stage in the erection of a memorial is the selection of a suitable stone for the memorial by the village community, which goes by the name kaatchi i.e to select. The villagers go to a nearby site to obtain a stone and after selection usually from a rock, sprinkle water over the stone with a prayer that all the spirits that have been inhabiting the place all long may depart so that the stone may be acquired for the memorial. The second stage (kaal kol) is offering flowers and incense and praising the stone, for it is “the stone” that is going to carry the name and fame of this great hero. Then the stone is quarried and placed on a cart and is brought to the village to the accompaniment of music and dance. The third stage is keeping the stone soaked in clean water for a number of days or specified time. It is held that since the stone remained all along exposed to vagaries of weather, like hot sun and rain, the stone is kept immersed in water, called Neerppatai. 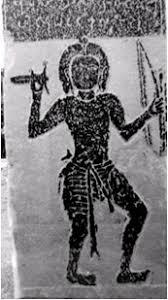 The hero’s figure is carved and his exploits inscribed on the stone, after which it is ceremoniously planted (Natuthal) in an appropriate place. A great food offering is made to the hero, which is a rite called Perumpatai. Finally the hero is praised and prayers are offered for the bestowal of prosperity on the village community[ Vazhthal]. This unique Tamil tradition persisted for long and such stones dated to later centuries have indeed been found.Though the first grammar for the Tamil language called Agathiyam was composed by sage Agasthiyar [ Agastya] and is said to have contained no less than 12,000 sutras or aphorisms, only some fragments which have been preserved in quotations by his disciples, Tolkappiyanar in his work on the same subject, otherwise it has not survived.